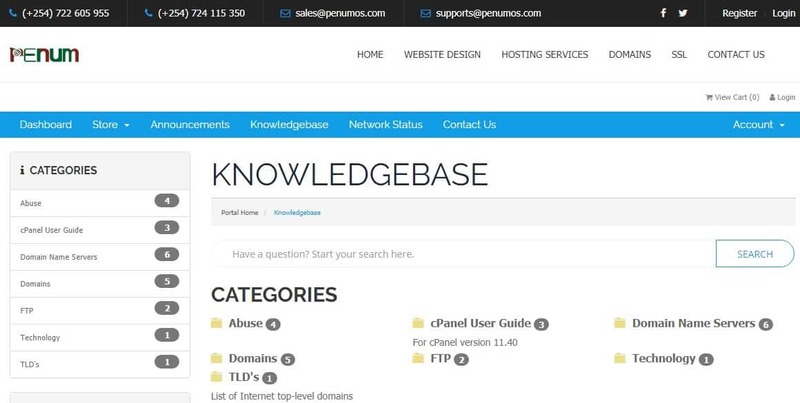 Penumos Review 2019: Is Penumos a Good Hosting? Founded in 2006, Penum Limited is a web hosting company with offices in Nairobi, Kenya. The vendor’s mission is to provide excellent internet services to customers in Kenya and beyond. The vendor offers shared web hosting, reseller hosting, VPS, and dedicated server services at affordable rates. In addition to hosting solutions, Penum Limited offers domain name registration, web design and development, SSL certificates, and SiteLock services. Penum Limited has two data centers from which it offers its website hosting solutions: one in the United States and the other in Europe. Its servers use the latest quad core Intel CPUs and come with a minimum RAM of 8GB. What’s more, the servers also include 100 Mbit/s connectivity and four RAID 10 drives. The RAID 10 configuration combines disk mirroring and disk striping for protection of data. Penum Limited’s shared hosting package comes with four main plans. At the entry level is the STANDARD plan suitable for setting up a blog or a small website. This plan comes with a disk space of 2.5GB and 25GB monthly bandwidth. Penum’s most advanced shared hosting plan is ECOMMERCE, ideal for medium-sized businesses. It includes unlimited disk space and unlimited bandwidth. You also get unlimited email accounts in all shared hosting packages from this vendor. Penum Limited offers backup and restore services. The vendor performs daily backups of your website data and restores them for free upon request. However, the hosting provider maintains that it is not liable in case these backups do not fully restore your website data, or if the restoration process causes any problems. In addition to providing website hosting solutions, this vendor offers professional web design and development services. For customers in need of advanced security packages, the hosting firm has SSL certificates and SiteLock packages. These extra security solutions come with an array of features to protect your website from hackers, malware, and viruses. 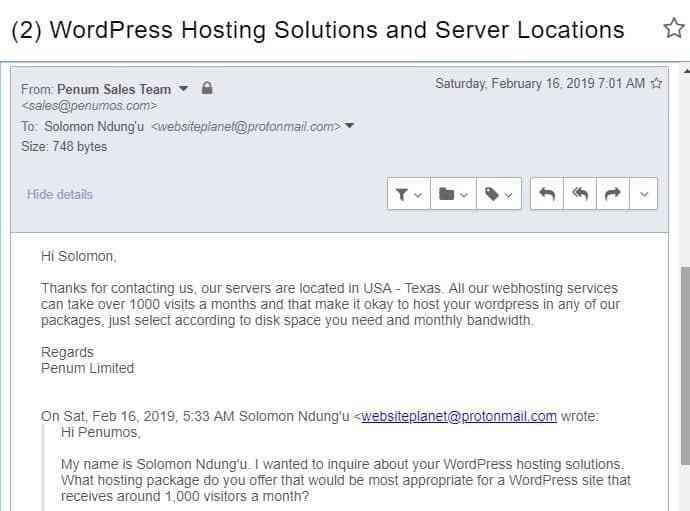 While Penum hosting plans are pretty cheap, they are only ideal for businesses that don’t mind the notable feature restrictions. The vendor lists the prices of these plans in Kenya shillings and U.S. dollars. The hosting plans come with flexible billing cycles and clients can make monthly and annual payments. Penum offers a 30-day money-back guarantee for its shared hosting solutions but has no refund policy for dedicated and VPS servers. However, the hosting firm maintains a network uptime guarantee of 99.9% with a compensation plan if your server experiences a downtime. You can contact Penum’s technical support team via phone, email, live chat, or ticketing system. The customer support team is readily available 24/7 and responds pretty quickly to enquiries: I sent them an email and got a response in less than two hours. In addition, the vendor has a fairly detailed knowledge base. Penum Limited hosting company is an ideal hosting vendor for both small and large enterprises. All the same, the hosting plans come with notable restrictions making them unsuitable for businesses that require unlimited hosting solutions. With data centers in the U.S. and Europe, Penum Limited has the capacity to host businesses from practically any region of the world. Wondering how Penumos stacks up against other Web Hosting companies? Enter any other Web Hosting company and we will give you a side-by-side comparison.